A rose is beautiful. A cyborg rose is beautiful and efficient. At least that is the primary notion put forth by a group of Swedish scientists at the Linköping University. 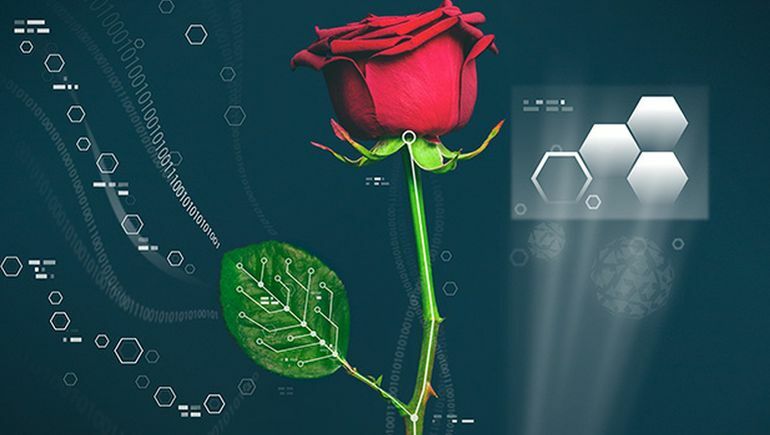 To that end, the researchers have demonstrated a series of electronic circuits running through the rose plant body. These conduits (with the potential ability to carry sensors and drug-delivery systems) are specifically grown inside the plant by making use of the nutrient channels possessed by the plant itself. So one of the end goal pertains to optimized provision of plant hormones and nutrients to such organic lifeforms, thus allowing for effective human control over the agricultural and floricultural output in the future. In terms of the incredible scope, the scientists were successfully able to incorporate almost 10 cm long electronic wires within cut stems of the garden rose variety. These are complemented by (separately cut) leaves comprising embedded electronic displays – which allows them to change their hue from light to darker tones. The researchers have also furnished transistors that work as primary switches – thus effectively introducing what they are terming as a ‘nervous system’ inside the cyborg plants. But the really fascinating part is – these electronic components are not as invasive as one would be inclined to think. In fact, the scientists made use of the natural system of connective channels (known as xylems) that are found inside plants. Simple put, these organic networks are naturally used as conduits that can transport water and nutrients to various parts of the plant. Now given the complexity of the task of infusing electronics inside natural systems, the researchers failed at their first attempt by initially opting for conductive polymer wires. On further analysis, they came upon the solution of PEDOT – a liquid composite consisting of a polymer called poly(3,4-ethylenedioxythiophene). Taking advantage of its fluidity, the substance could easily be distributed among the xylems. Moreover, it was also found to solidify after some time, thus resulting in solid wires that can conduct electricity. On the other hand, the xylems are still able to continue with their natural function of carrying water and nutrients. So after the basic setup was completed, the scientists proceeded on to create the aforementioned ‘transistors’ with electrochemical capacity. In other words, the components were designed to convert chemical signals into electronic outputs, and as such alludes to the core hardware of future cyborg plants. Additionally, the experts also tried their hand at transforming rose leaves into electronic displays. This was achieved by injecting a slightly different PEDOT solution into the leaf. As a result, a patchwork of conductive material was infused along the lamina. The leaf was then put between two external, thin films of PEDOT – which accounted for an electrical connection between the solutions. When translated to the actual effect, the researchers were able to remotely manipulate the infused material within the leaves. In visual terms, the leaves changed their color from light to darker hues within 20 seconds, all via the command given by the scientists. Considering these impressive effects, it begs the question – what can be the potential applications of cyborg plants? Well the answer lies in how far scientists can develop electronics that are to be ‘naturally’ embedded inside the plants. For example, a separate (but similar) technological scope entails the integration of bio-fuel cells in plants that can transform the plant specimens into solar power plants. Simply put, the embedded components and their variance, could aid in generating ‘green’ electricity from natural photosynthesis – where sunlight is utilized by plants for conversion into usable chemical energy. Furthermore, as we mentioned before, such a cyborg plant ambit also opens the way for better regulation and greater productivity in the fields like agriculture and genetic modification. The study was originally published in the journal Science Advances. 1 Comment on "Cyborg plants can pave the way for electronic agriculture with optimized productivity"
This is an interesting development which no doubt if fully developed has quite some potential. Using plants to generate electricity by taking advantage of one of nature’s own processes, photosynthesis, is, I must say, a most novel way of harnessing the sun’s power. Likewise, being able to understand physiological processes occurring in real time within a plant as it grows would yield valuable insights into optimising plant development and subsequent gains for the fields of agriculture and horticulture. This research may even lead to the technology being used in human health care. My guess is that, to make it more efficient, the next step will be to develop a way of having this electro-conductive polymer occur naturally within the plant tissue itself as it grows rather than introducing it from outside via injection, maybe by the development of a special plant food that can be taken up by a plant’s roots and thus incorporated as an integral part of the plant as it develops.